IDA-STEP v4 is installed in a two step process; you first install the basic framework on your computer and then, after IDA-STEP is started, the second part of the installation takes place which automatically downloads and install the free and paid components by direct Internet access to our servers. This process is called "online installation" and requires that your computer settings (e.g. firewall) allows IDA-STEP to access the Internet, For the free IDA-STEP Viewer Basic this is the only available installation method. For regular paid licenses an alternative method for the second installation process - the so called "offline installation" is available. For this it is sufficient to have Internet access with any browser on any computer. With a good Internet connection the complete installation (online or offline) should not take you more than 15 minutes. Note: For Linux and MAC OS X you first have to extract the IDA-STEP archive into a folder before you can start the executable from there. Second step: After the initial installation start IDA-STEP. The "Register, Update and Install" dialoge will show up. Select either "Free license" or "Enter license ID" if you purchased one. IDA-STEP then connects to the Internet and displays available components to download (for the free license this is "Viewer: Basic"). Select all of the offered components for installation and follow the given instructions. At the end IDA-STEP restarts and the installation is finished. View detailed installation instructions for IDA-STEP v4 here. When processing the second installation step with the "Free license" option, a free one year single computer "IDA-STEP Viewer Basic" license is automatically granted to you. You can repeat this process at any time (e.g. after one year) and on as many computers as you like. You can use the granted license for any purpose, including commercial, private and academic use. 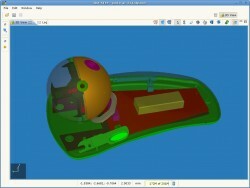 Read more about IDA-STEP Viewer Pro 3D here. Besides the Basic and enhanced Pro-3D viewer other components are available for IDA-STEP v4. To add additional components, purchase them using the online LKSoft shop. After the purchase is processed, the purchased components are available for installation (Second step above). You can either choose to enter a new license ID or update your existing license using the IDA-STEP v4 Register dialog (click on Help › Register, Update and Install...). View information about IDA-STEP v4 components here.